← 01.27.2015 Once more with feeling….. Here is the, I promise, last from Sunday. I was under the weather today, since last night actually, and couldn’t sleep much after waking around midnight. One of the things i was thinking about is the state of where my photography is going. I’ve been unsuccessful making a business out of it. I just don’t have the assertiveness, I guess, to push hard and get seen by editors etc. There are few galleries around here that show photography and I am not much for traveling. So I decided to declare myself an advanced amateur hobbyist. I’ll still sell when I can, but at least I no longer have to beat myself up over it. I am considering changing my website host to zenfolio and linking to this blog from there. I’d have to change my URL, but so far not many folks are using the old one. I could just link to my present host but that’s an additional expense and zenfolio is about 1/2 the cost which is a consideration as time passes. FAA is cheap for a year so no reason to drop that. 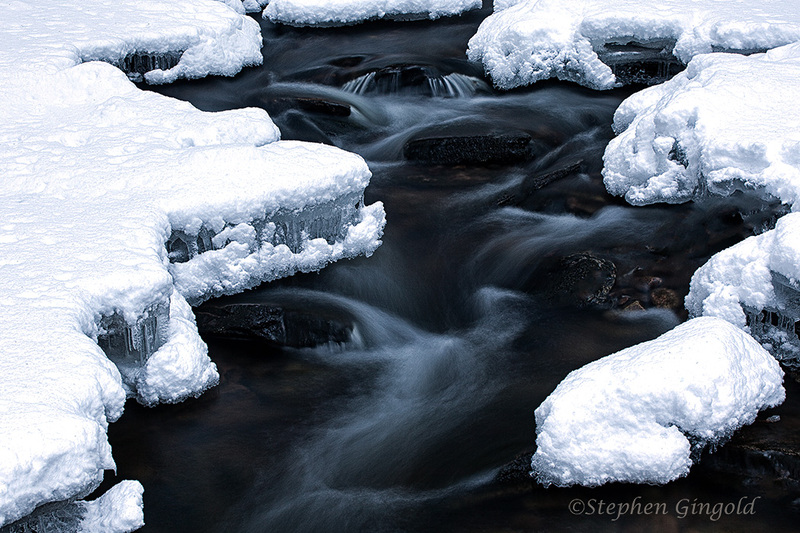 This entry was posted in Ice, Intimate Landscape, Nature Photography, Water, Western Massachusetts, Western Massachusetts Waterfalls and Cascades and tagged cascades, Dean Brook, ice, intimate landscape, Massachusetts, New England, Shutesbury, water, western massachusetts, winter. Bookmark the permalink. I understand your decision. Better to relieve the pressure on yourself. Do it for your pleasure and enjoyment, and ours. It would be nice to make money on your creative works. That’s really hard to do for anyone, no matter what their pursuit. I have a friend from high school days who works really hard at it. He has a photography studio where he displays and sells his photographs. He is always marketing himself and his photos. I have always had a realistic view regarding the odds of making serious money at this. The competition is fierce and the proliferation of sites practically giving away images adds to the difficulty. I have read similar stories like your friend’s regarding constant hustling to keep the income flowing. There are a lot of talented folks out there. Nice shot! I feel your pain. It is practically impossible to make a living in nature photography. That certainly does not reflect on the strength of your work. It probably doesn’t even say anything about assertiveness. From talking to people, really great photographers included, unless they are doing serious commercial photography that they use to finance their more artistic endeavors, they are using some other job/profession. I asked one of my inspirations, Ron Rosenstock about this. He’s been successful over many years and he said, paraphrasing, we do this because we have to, because life wouldn’t be complete without artistic photography. If we can sell some stuff, great, if not, we do it anyway. That really freed me up to think about going at the photography in a way that I love. I hope we’ll still keep seeing the great work! Thanks, James. It seems that those who do make a living at this do so by doing other than making images, like leading workshops. I helped a friend do that once but it is not in my makeup to teach. I absolutely agree with Ron that we pursue creative arts out of personal necessity and a love of the craft. I’m coming at this from a different perspective…I have seriously considered developing my photography passion into more than a serious hobby several times, but have never regretted my decision(s) not to. I’ve sold a few images through the years, mostly to friends and acquaintances, and even shot two weddings, and have been happy to recycle the meager earnings into the hobby. I can well imagine the pressure one must endure and embrace to try to make it pay, and I’m pretty confident that it would take the lion’s share of the fun out of it for me, and I would consider that tragic. I feel that you have made the right decision and that you will feel enlightened (in both senses of the word) by your newfound freedom. I’m looking forward to your lightness! It has been taking the enjoyment out of it to some degree, Gary. I am lucky to be able to lose myself in the moment while shooting and immersing in the location and subject. Afterwards comes the stress and a certain level of guilt over spending time editing rather than digital door knocking etc. I am very comfortable with the decision, thanks. Aaah freedom!!! I am sorry that I can not offer any supportive words. I think you photography is creative and awesome. This shot today looks mysterious and extremely cold. Maybe you could try going back to not so much editing or changing of how a scene looks.Why not see if you can publish your own book. Then again,I have no idea what, that would cost but it’s something you could explore. I hope you are feeling more well, and that you will be well more. Susan and I both love seeing your images and are proud of the Gingold hanging in our dining room. If we had more walls and more cash there would be more Gingolds here. The only nature photographers I am aware of who make a living at it make the money on paid assignments – but that means travel. You have real talent Steve; your artwork can’t be measured by commercial success. I hope your decision allows you to enjoy your photography more and perhaps to open up your forms of expression in different directions. Another beautiful image, thank you for sharing it. Thanks too for the encouraging words. Getting those commercial assignments would have been something to have pursued in the past as part of a developing career, I am afraid. I am sure that I will enjoy myself a bit more now for the decision. I agree with most of what folks have already said … let me add my two cents. If you weren’t sick, and if I didn’t have to teach tomorrow, and if I were a beer-drinker, and if you enjoyed a brew now-and-then, and if I lived lots closer, then I’d invite you out for a beer and we could talk about this. Given that you are, and I do, and I’m not, and I’m not sure if you are, and I don’t – then you’ll have to take a rain check for a nice ice cream or something! It’s clear that you have been struggling with this issue for quite some time. As have I. And I’m sure many like us have as well. The conclusion that I have drawn about photography as a business is 1) you either have to be a real go-getter … who has been lucky to develop a niche market, of 2) you need a ‘day’ job which supports the photography that you love. I SPEAK FOR MYSELF (read that phrase again before proceeding) when I say ‘Who am I kidding.’ There are lots and lots and lots of folks out there who take really, really, really nice photographs. And the reality is that very few can make a sustainable living from it. Many sell something here and there – and that’s great. And many more simply frustrate themselves by believing the endeavor can be self sustaining. I don’t really enjoy recognition of the reality which is that I need to do the photography because I enjoy it – period. Seeing something that I believe to be truly beautiful on the monitor before me is a real rush. I find myself saying stuff like, ‘Whow … I took that … really nice. Cool.’ I do it for that feeling of achievement. I have to derive the pleasure there because I am not a business person, I’m not capable of ‘selling,’ and I haven’t been lucky enough to have fallen into one or another niche market. The truth is that I enjoy the photography for its’ own sake. Like exercise, good food, and lots of sleep, the photography is good for me. I do it for me. And, I don’t think there’s anything wrong with that. I think that if I should ever be lucky to move … and if I should find the nerve to put a few images in a gallery … and if I should be lucky that someone likes one or more well enough to put down some cash … I’ll smile and take Joanna out to dinner. And, that’ll be that. The most important thing right now is not to let this bother you and to get well soon. Ice and snow and spring await you and your camera. You gotta get out there and make art. Hang in there. That’s a well-thought-out, heartfelt, and well-expressed reply. I really like the way you put together the beginning of this comment, David. I bounced back and forth between the phrasing to see how it all matched up. I agree with your points regarding niche and needing back up support. I do still have that day job, but even with that it is still not happening but I am ok with that. I experience that wow factor too when the display brings a scene to life from an unprocessed raw file. After being out there enjoying nature, developing the image is the best experience when something worthwhile has been captured. Your picture is an excellent chiaroscuro: such rich blacks, whites that are super bright but held in check. I commiserate with you on the difficulty of making a go of nature photography as a business. Pax tecum, peace be with you. Thanks, Steve. It just became less difficult to make a go and easier to enjoy what we love about the craft. Firstly I really like the photo – absolutely gorgeous. I think becoming commercially successful involves a lot of luck and as a mutual friend once said, giving away 90% of your work in the early days. I have never contemplated trying to sell my efforts. I don’t want the hassle and I have never got to grips with printing for starters. I just take them to a lab. You may find that success will come unexpectedly once you take the pressure off – you can still show if you wish but of of course that entails a cost. I am not sure whether digital is an unqualified positive for photography. It has democratised the hobby but also devalued it. The room for the advanced amateur is still there but I think only by going to a camera club or the like will you get the feedback you need on what works and what sells. Otherwise your work is lost in an ocean unless you can find a way of exploiting social media to the full. Few of us have the time and put in the effort to do that. I have never come to terms with the fact that some of my favourite images get little or no reaction whilst those that do occasionally take off (very rare indeed) baffle me by their appeal. They would not be in my hot hits! Photography and success are not always linked to quality. Sadly we have to accept that and also that even if we deserve success it may never come. Very well expressed, Andrew. All good points. There are a few clubs around here but I am not inclined to join. Mostly because they meet at night and I am in bed half way into the meetings. Digital has definitely devalued photography as a gainful pursuit. It has also through lack of understanding and questionable practice caused both nonphotograher and purist to doubt the validity of the final product. There is no way to predict the taste of others. Critics have opinions that are often off the mark, so it is not surprising that the average viewer would have varying opinions. Your last line is so true. Fortunately, most of us can accept that without losing an ear. I have one friend who finally is making a living by his photography, but the great irony is that he’s still “working a job” in order to support his art. The big difference is that, instead of working in a factory, he’s a wedding photographer. And believe me, even though he’s quite good at it, and very creative, there are days he’d love to be back in the factory. One thing’s for sure. Being paid for your photos isn’t a bad thing, but taking photos only to be paid can lead to difficulties. Beyond that, I learned an important lesson when I began my varnishing business. I wanted to work around boats because I loved the water and loved sailing. As time went on, I sailed less and less. Now? It’s been a while since I’ve been out on the water. I think that’s part of the reason I’ve been resistant to turning my writing into a money-making endeavor. Even assuming I could, I’ve lived in the world of writing to deadline, and so on and so forth. I don’t want something I so deeply enjoy to become just a job. On the other hand, it’s not an either/or proposition. Supporting yourself with your photography is one thing, but there’s no reason you can’t end up supplementing your income through photography: perhaps even nicely. Aside from giving up photography, maybe the next last thing I would want to do would be wedding photography. It takes a special personality and immunity to pickyness to pull that off and I don’t possess either of those. Absolutely, photographers , or anyone in the arts, need something inside driving them besides the drive for money. I believe that even assignment photographers need that to turn out great work and achieve the results they have been hired for. I understand your reticence to write for gain. I do hope to continue to bring in some income…I just won’t have to worry about it as much. Are you talking about the banner image? It’s safely archived. It just this minute struck me — the first photo of yours I’ve thought about purchasing is a black and white. That’s just funny. That’s not black and white. Don’t you see the blue? 🙂 I’ll be sure to keep it safe and duplicated as insurance. Of course, it would be very easy to convert it to B&W. I’m late to this party, thinking about what you wrote and wondering how to respond. It’s never easy when a dream dies. I have a little understanding since I’ve contemplated that road a few times and always came to your conclusion. “Build it and they will come” no longer applies to selling photos – if it ever did. I hope you find new joy in pursuing your passion, unencumbered by secondary concerns. Fortunately, I have actually fulfilled a couple of dreams, Lyle. One was to be published and another was to have a cover shot on a magazine. I also landed a banner with LLBean. So there is that. But the hope of a steady stream of income was probably unrealistic with my lack of business drive. I guess the phrase should be “build it and then push, push, push”. But we have a home, three meals a day plus snacks and a few other “necessities of life” so it’s all good. And I love spending time immersed in nature and photographing what I see. Even better. Thanks! I hope you are enjoying life too. Well said. Fulfilled dreams AND snacks sounds pretty good. Making good photos and pushing to sell them seem like unlikely talents for one person to possess … at least to me.